Figure 1 – In the AMPH sensitised state, increased firing of hippocampal (HIP) neurons leads to reduced ventral pallidum (VP)-inhibitory control of dopaminergic output from the ventral tegmental area (VTA). This results in an enduring increase in dopaminergic neurotransmission. Injections of cannabidiol (CBD) into the nucleus accumbens shell (NASh) increases synaptic levels of anandamide (AEA). AEA inhibits hippocampal output to the NASh and this leads to increased VP-inhibitory control of the VTA, thus normalising dopaminergic neurotransmission. Green line – glutamergic afferent, red line – GABA-ergic afferent, blue line – dopaminergic afferent. The pharmacological strategy for the treatment of schizophrenia has not changed in the six decades since chlorpromazine was introduced in 1952. Although several newer agents have recently gained approval, the mechanism of action of antipsychotics is still largely based on normalising dopaminergic neurotransmission which does not adequately address the symptomatology of a very complex disorder (Hyman, 2014). Moreover, they cause side effects such as extrapyramidal motor symptoms and metabolic syndrome which can worsen the patient condition. In this regard, preclinical and clinical studies since the '90s have demonstrated the antipsychotic potential of cannabidiol (CBD), a derivative of the cannabis sativa plant which does not have the adverse psychoactive properties of tetrahydrocannabinol. In particular, CBD has been shown to be effective in attenuating the positive symptoms of schizophrenia with a negligible side-effect profile. However, the underlying antipsychotic mechanism of antipsychotic action of CBD remains unclear. Accumulating evidence implicates dysfunction of the mammalian target of rapamycin (mTOR) signaling cascade in the pathophysiology of schizophrenia (Gururajan and Malone, 2016). Thus, in a recent paper, Renard et al. (2016) used the amphetamine (AMPH)-sensitisation protocol in rats to investigate whether the antipsychotic effects of CBD were mediated by its effects on the mTOR cascade. Specifically, they focused on the nucleus accumbens shell (NASh) which has been implicated as a therapeutically relevant 'hot-spot' for antipsychotic action and is one of the brain regions targeted by CBD (Guimaraes et al., 2004). The AMPH-sensitisation protocol leads to the induction of a permanent hyper-dopaminergic state in limbic regions and is characterised by a behavioural phenotype that is clinically relevant to the positive symptoms of schizophrenia (Featherstone et al., 2007). Renard et al. used two behavioural testing paradigms – the open field and prepulse inhibition (PPI) of the acoustic startle response. Consistent with sensitisation phenomena, Renard et al. reported that AMPH-treated rats were hyper-reactive to an AMPH-challenge, displayed significant hyperactivity, stereotypic behaviours in the open field arena and deficits in PPI. Intra-NASh pretreatment with CBD was able to inhibit the development of these behaviours. Thus, together with the fact that CBD alone had no behavioural effects, the behavioural findings reinforce the potential utility of this cannabinoid as an antipsychotic for the treatment of the positive symptoms of schizophrenia. To determine whether the antipsychotic effects of CBD were mediated by effects on the mTOR signaling cascade, Renard et al. analysed the phosphorylation levels of the mTOR protein and its downstream target p70s6k. Activation of the Akt/GSK3 pathway is reportedly a mechanism of action for both typical and atypical antipsychotics and so the phosphorylation levels of these molecular mediators was also assessed. Intra-NASh CBD pretreatment of AMPH-sensitised rats increased phosphorylation of mTOR and p70s6k whereas it reduced phosphorylation of Akt and GSK3β. Importantly, all the prophylactic effects of CBD on schizophrenia-like behaviours in AMPH-sensitised rats were inhibited by co-administration with the mTOR inhibitor, Torin2, and the p70s6k inhibitor, PF4708671. These neuromolecular findings led to the conclusion that a potential antipsychotic mechanism of action of CBD involves activation of the mTOR signaling cascade. The authors also suggested that CBD is able to 'bypass' Akt/GSK3 signaling cascade and this could account for the lack of observed side effects associated with conventional therapies. These are the most important findings of this study and highlight the possibility that the mTOR cascade could be an attractive target for the development of new antipsychotics. However, the authors' conclusion comes with several caveats. Dopamine receptor blockade in the dorsal striatum has been implicated in the development of extrapyramidal motor symptoms and evidence does suggest that CBD preferentially targets the NASh over this brain region (Guimaraes et al., 2004) but comparative neuromolecular analyses in these brain regions in this study would have supported the authors' claims. In terms of metabolic syndrome, CBD has previously been shown to have anti-diabetic properties and promotes lipid metabolism but this property has not been explicitly studied in the context of schizophrenia. A second caveat associated with interpretation of neuromolecular analyses is the lack of data showing the effect of the AMPH sensitisation protocol alone on Akt/GSK3/mTOR signaling relative to control treated animals. Lastly, the mTOR signaling pathway is activated by a diverse range of receptors including the canonical cannabinoid receptors. CBD is able to act as a ligand at these receptors but with weak affinity. An alternative explanation is based on the ability of CBD to inhibit the hydrolysis and reuptake of the endogenous cannabinoid, anandamide (AEA) (Bisogno et al., 2001). Increasing the availability of synaptic AEA results in increased activation of the mTOR signaling cascade. Recent work has shown that haloperidol increased neuronal complexity in vitro via activation of the mTOR signaling cascade, a mechanism which was suggested as a being involved in the acute and long-term effects of antipsychotic treatments (Bowling et al., 2014). A similar analysis with CBD would provide an insight into the structural effects of this cannabinoid on neuronal and synaptic architecture. With a view to revealing the neural circuit that may be involved in the antipsychotic effects of CBD, Renard et al. showed that intra-NASh CBD pretreatment was able to attenuate a surge in dopaminergic neuron activity in the ventral tegmental area (VTA) of AMPH-sensitised rats following a challenge dose of AMPH. But there were no experiments conducted to determine if baseline VTA activity in the AMPH-sensitised rats prior to the AMPH challenge was different to control treated rats. Increased VTA activity has been linked to activation of ventral hippocampal glutamatergic projections to nucleus accumbens GABA-ergic medium spiny neurons (MSN) which inhibit ventral pallidum (VP) neurons that in turn tonically inhibit the VTA. Consistent with this polysynaptic circuit, AMPH-sensitisation has been shown to enhance firing of hippocampal neurons and subsequently VTA dopaminergic neurons (Lodge and Grace, 2008). 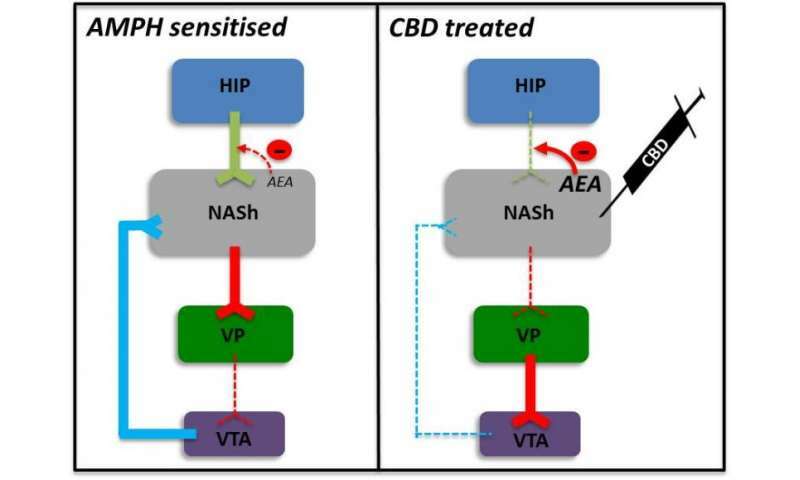 One hypothetical mechanism which could explain the effects of intra-NASh CBD could, as described above, be its ability to increase synaptic levels of AEA. Acting as a retrograde messenger, AEA would inhibit hippocampal afferents leading to reduced activation of NAC MSNs. This would result in disinhibition of VP neurons, inhibition of the VTA and a reduction in dopaminergic tone (Figure 1) which could underscore improvements in schizophrenia symptomatology. 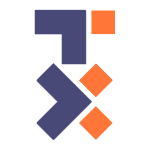 Overall, the work of Renard et al. has provided a novel insight into the mechanisms that underlie the antipsychotic properties of CBD, especially for the treatment of positive symptoms of schizophrenia. However, there has remains a dearth of studies focussed on determining whether CBD is able to treat the cognitive symptoms, which are closely linked to functional outcomes, and the negative symptoms, which precede the onset of the positive symptoms. This should be an important focus of future investigations. At a time when clinicians are at an impasse in terms of providing more efficacious therapies to improve the lives of patients suffering from schizophrenia, a sustained commitment to further research into CBD to accelerate its progress to the clinic is likely to yield significant benefits. More information: Bisogno T, Hanuš L, De Petrocellis L, Tchilibon S, Ponde DE, Brandi I, Moriello AS, Davis JB, Mechoulam R, Di Marzo V (2001) Molecular targets for cannabidiol and its synthetic analogues: effect on vanilloid VR1 receptors and on the cellular uptake and enzymatic hydrolysis of anandamide. Br J Pharmacol 134:845-852. Bowling H, Zhang G, Bhattacharya A, Pérez-Cuesta LM, Deinhardt K, Hoeffer CA, Neubert TA, Gan W-b, Klann E, Chao MV (2014) Antipsychotics Activate mTORC1-Dependent Translation to Enhance Neuronal Morphological Complexity. Sci Signal 7:ra4. Featherstone RE, Kapur S, Fletcher PJ (2007) The amphetamine-induced sensitized state as a model of schizophrenia. Prog Neuropsychopharmacol Biol Psychiatry 31:1556-1571. Guimaraes VM, Zuardi AW, Del Bel EA, Guimaraes FS (2004) Cannabidiol increases Fos expression in the nucleus accumbens but not in the dorsal striatum. Life Sci 75:633-638. Gururajan A, Malone DT (2016) Does cannabidiol have a role in the treatment of schizophrenia? Schizophr Res In press. Hyman SE (2014) Revitalizing psychiatric therapeutics. Neuropsychopharmacology 39:220-229. Lodge DJ, Grace AA (2008) Amphetamine Activation of Hippocampal Drive of Mesolimbic Dopamine Neurons: A Mechanism of Behavioral Sensitization. J Neurosci 28:7876-7882. Renard J, Loureiro M, Rosen LG (2016) Cannabidiol Counteracts Amphetamine-Induced Neuronal and Behavioral Sensitization of the Mesolimbic Dopamine Pathway through a Novel mTOR/p70S6 Kinase Signaling Pathway. J Neurosci 36:5160-5169.